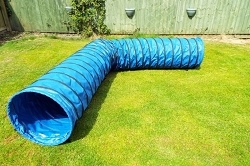 Our dog agility tunnels are heavy-duty and all conform to KC and UKA specifications. They are available in a range of colours and two sizes of 3m or 4.5m. 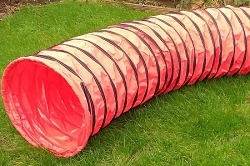 The tunnels are all made of very strong weatherproof 600gsm PVC and durable wire end rings and spiral wire to ensure hours of fun for you and your dog. 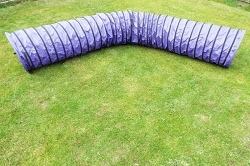 If you would like to order dog agility tunnels in bulk, please call us on 07888 837 220 to discuss your requirements.